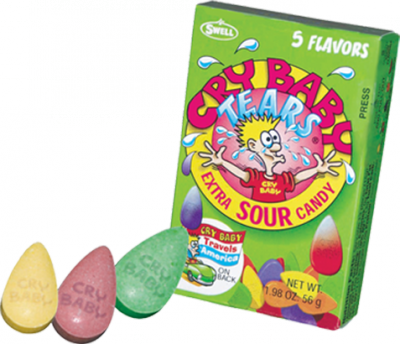 Intensely flavored in near eye-watering sour proportions Cry Baby Tears Extra Sour Candy satisfies the most insatiable sour candy cravings. 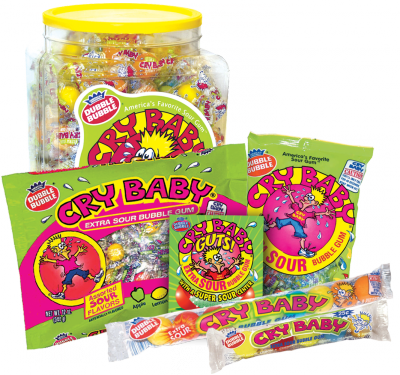 Cry Baby Extra Sour Candy is one of America's most popular sour-steeped confectionery treats. With the same intensely flavored in near eye-watering sour proportions as they candy, Cry Baby Extra Sour Bubble Gum satisfies the most insatiable sour chewing cravings. Mouth-puckering Cry Baby Extra Sour Bubble Gum provides long-lasting bubble gum chewing fun. Available in both gumball and twist form. They're available loosely packed in 5- and 9-ball sleeves; and individually wrapped in multi-count bags, jars, and tubs. Bite 'em, Drink 'em, Chew 'em and pucker! Are you ready to give your taste buds a jolt? If so, give Cry Baby Extra Sour Mini Drinks a try.